called “SpringSled”. He posted a link saying – “Honestly I don’t know what this product is, but if you sign up using this link, I will get it for free for 12 months”. He even wrote a blog post about it. I was intrigued. If you’ve been following my blog, you already know that i’m a sucker for productivity tools and workflows (I’m actually working on a 12 minute video to help content marketers set up their own content echo-system). So the hook was in. I clicked on the link to see what he was talking about. 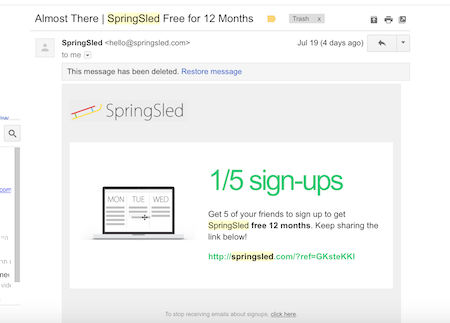 At the first glimpse, “SpringSled” is yet just another project management tool. However, the only difference is that it has over 120,000 users before even launching. It’s definitely not the first time a startup pulls off a successful ‘waiting list’ stunt – Mailbox was famous for its waiting list maneuver and lately Robinhood has been successful at that as well. Yet, I think every startup that manages to pull that off successfully is worth learning from. I don’t know if creating a really good landing page should called a hack, but it is defiantly worth the mentioning. “SpringSled”’s landing page got me from first sight. It delivers the company’s promise on every level. 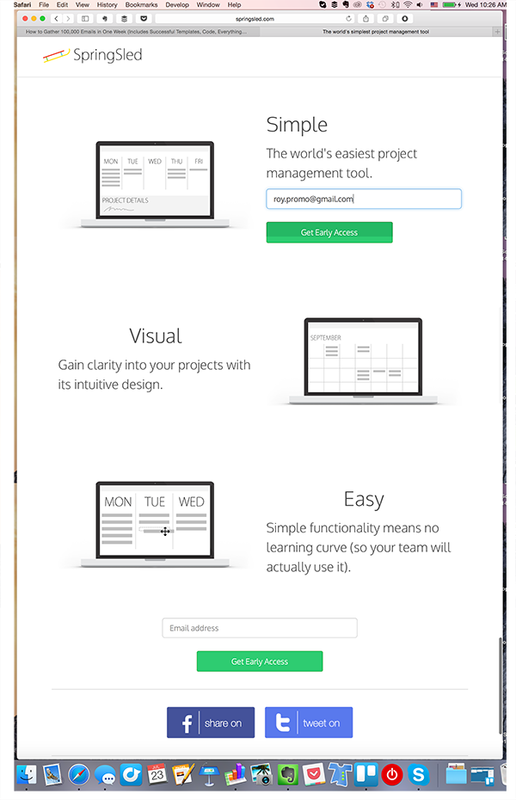 The company promises the simplest project management tool and it means simple. The landing page 3 features emphasized: Simple, Visual and Easy. These are short and simple promises. Each image doesn’t show off much of the platform, only 3 simple screens – almost wireframe looking like, showing of how simple and stripped down their tool is. Personally, I would probably have been scared to publish such a simple landing page, but they pulled it off. After all, getting all your team members to be on board with the same project management system isn’t very easy. There’s always some rouge employee that doesn’t embrace the method, and they confront just that concern. A simple landing page that delivers the company’s promise on every level is a great way to build trust, showing users you are truly practice what your preach. “SpringSled” has started shooting for referrals from step one. Right after the “get early access” call to action button, they have already prompted you to share. Logically, I don’t see the point in those share buttons, as they distract users from the main CTA. Though it might help them to capture those early birds who won’t sign up, yet love spreading the word about new products they find. The interesting part begins after you enter your email. 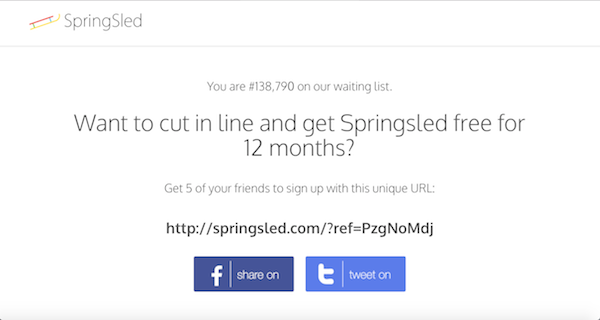 Instead of the popular “share to get early access”, “SpringSled” offers you to cut in line and get their product for free for 12 months if you get 5 people to sign up. This is basically a mixture of the classic “share to get in line” and Dropbox’s “invite friends to get storage” incentives. The idea that you can save money on a product you’re curious about and get to use it sooner than the rest of the world is a good enough incentive for a simple share. Another aspect I liked was the fact that “SpringSled” offered only Facebook and Twitter as their social media, not necessarily trying to utilize every social network out there. Also getting 5 people to sign up isn’t too big of a task. It seems reachable for almost anyone and of course – enough to create a great referral program. Beginning of the Viral loop – Twitter or Facebook? Most startups using the “waiting list” method usually send you a thank you email telling you your place in line, and then send you another email announcing your number is up. 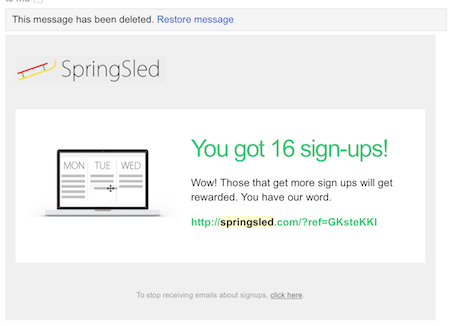 “SpringSled” followed up and encouraged you to make sure you get the 5 sign ups. Before you get to 5 sign ups – they send you an email showing your progress (you got 1/5, 2/5 etc.). Showing you your progress gamily’s your experience because you have your own personal goal to reach. Also, each email reminds of the incentive you’e working for. 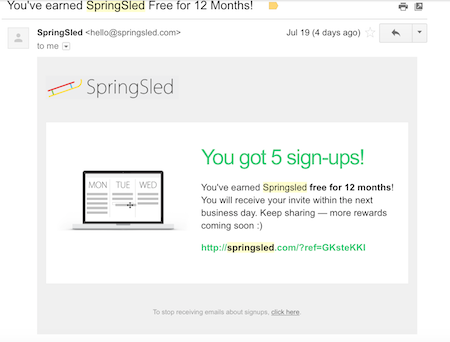 You’ve reached 5 sign ups – it’s a simple email congratulating you for getting “SpringSled” for free for 12 months. See how they talk about your benefit and not theirs. Also, now that you’ve reached your goal, you will get the invite in the next 24 hours. Knowing your influence, as people will sign up to what you share on your social media, based on your recommendation alone, is always a confidence booster. The process and results are self rewarding. Hence, “SpringSled” appreciates every sign up you bring them and will remember and acknowledge you for the early adopter you are. On both levels, “SpringSled” flutters the user and give them values. What’s noticeable and impressive for “SpringSled” is their treatment of the whole process as a viral loop. Once you land on their landing page, you are already placed in the middle of a viral loop that makes you a part of it. You came in by referral and they keep focus on making sure you’ll complete your own viral loop and encourage new users to enter it as well. Even when after finishing the loop, their emails keep you in it, emphasizing the benefits you get from it, financially and emotionally. What is your opinion on the referral methods and is there anything you would have done differently about them?